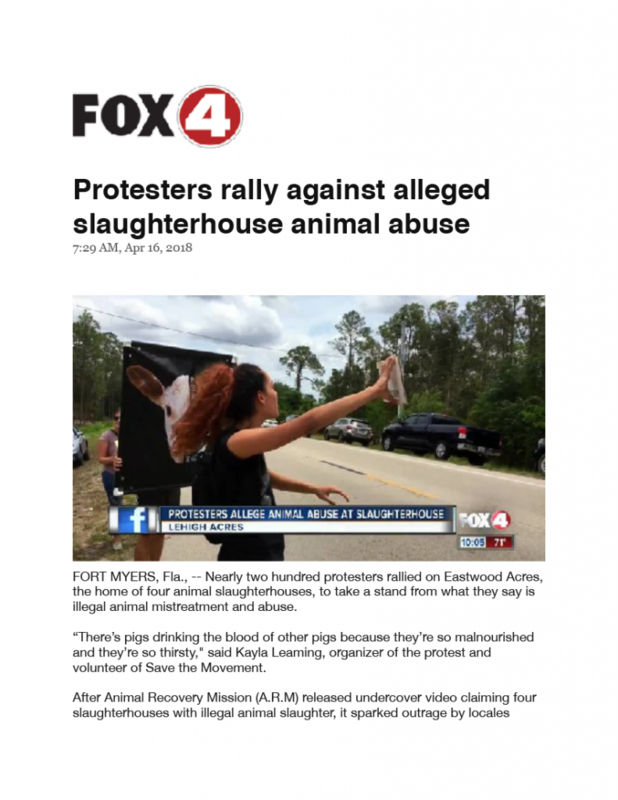 In July of 2015, operatives of Animal Recovery Mission (ARM) endeavored upon an undercover mission, on what was suspected to be an illegal animal slaughter farm. 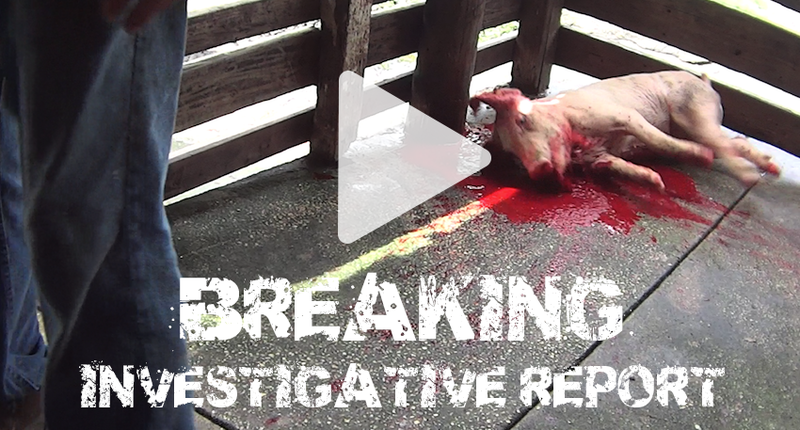 Within minutes, undeniable evidence confirmed inhumane and heinous crimes against animals. 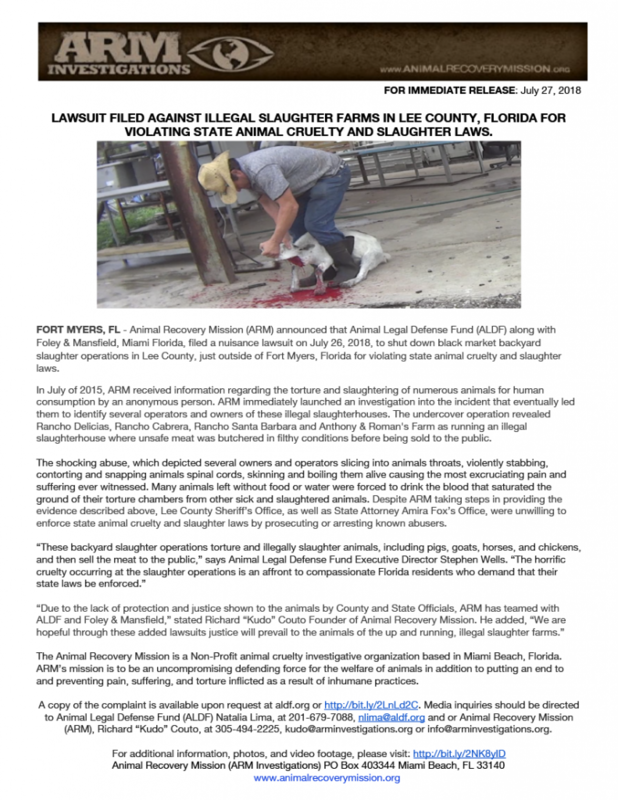 What transpired from this initial discovery, has since led to a grueling 2.5 year investigation timeline, which has exposed a total of four illegal animal cruelty operations. These include; Rancho Delicias (View Reports: Part I, Part II), Rancho Anthony & Roman(View Reports: Part I, Part II), Rancho Santa Barbara (View Report) and Rancho Cabrera (View Report). 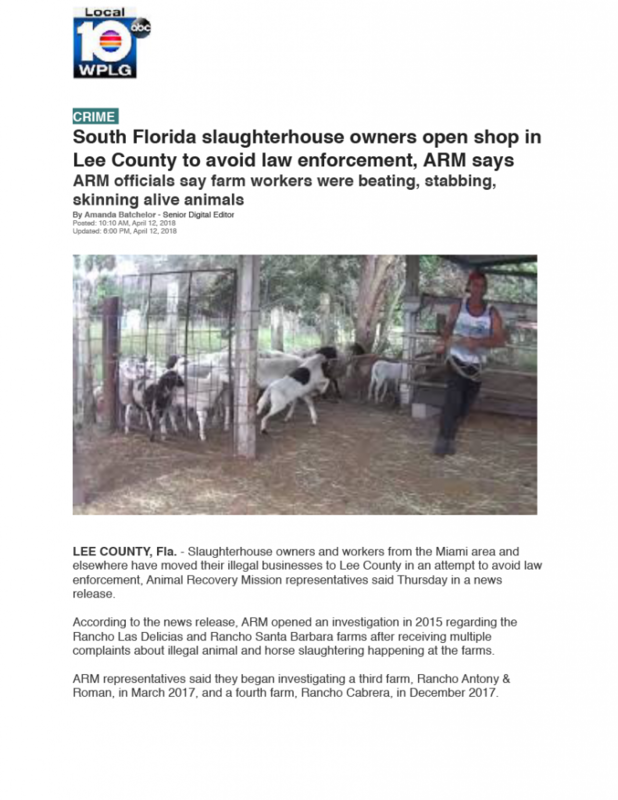 In-depth findings on each of the slaughter farms can be reviewed by clicking on the image thumbnails, below this summary. 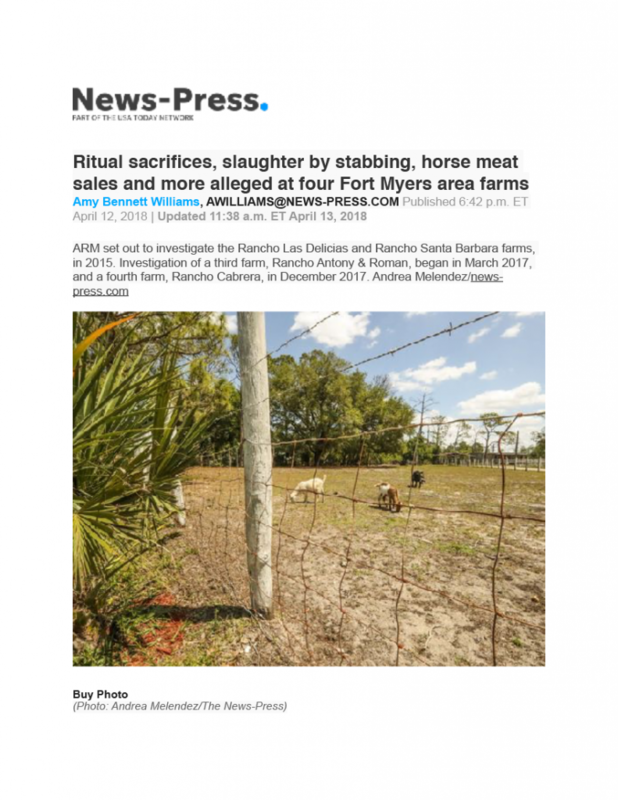 The butchering and sale of horse meat – an intricate underground black market industry in South Florida. 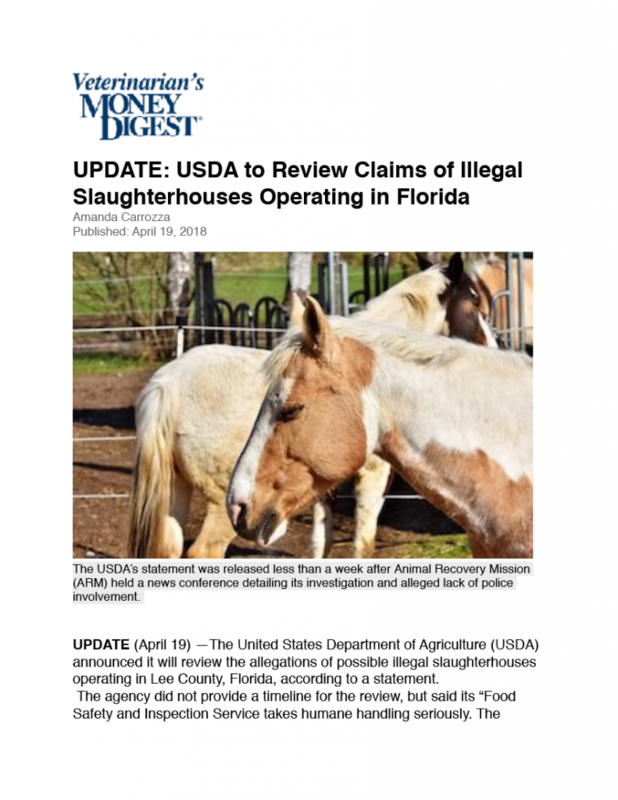 View positive horse meat test from undercover buys and the Good Horse Slaughter ACT of 2010. Aggression training tactics used upon dogs for animal fighting purposes. 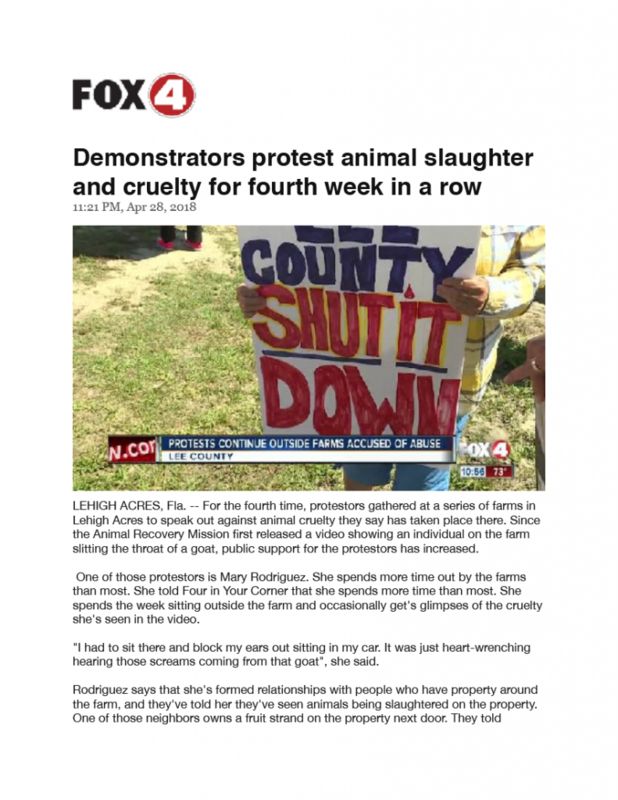 Animals, both farm and domestic, are being traded and exploited for ritualistic ceremonies. This includes puppies and mature dogs. 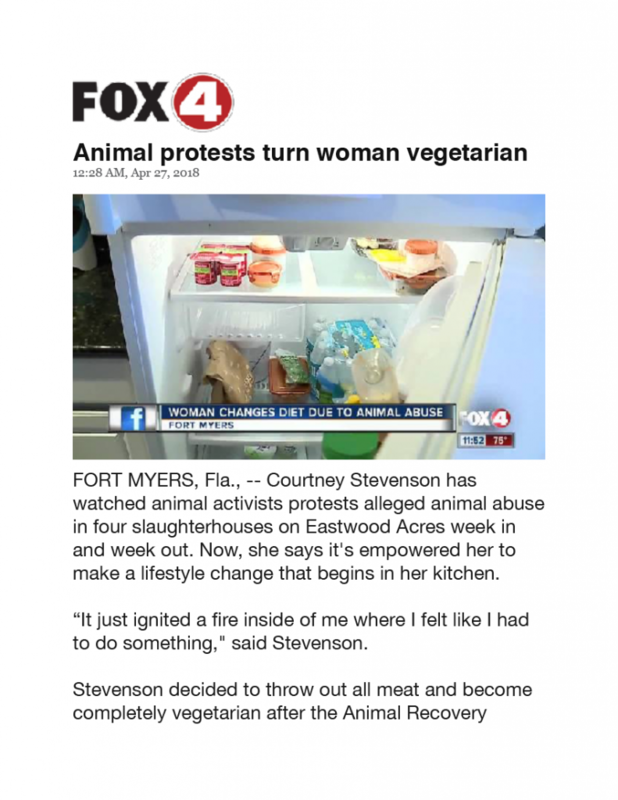 Animals are inhumanely stabbed, dragged, and drowned in boiling water, whilst still conscious and sensible topic. 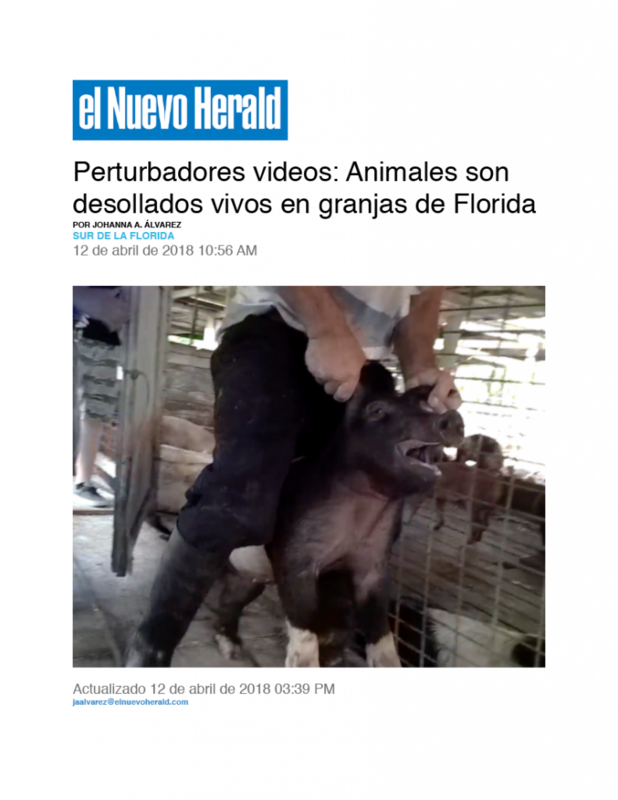 These are all gross violations of the Humane Animal Slaughter ACT. Animals live in unsanitary conditions and are malnourished, dehydrated and denied of medical attention from injuries and illnesses. 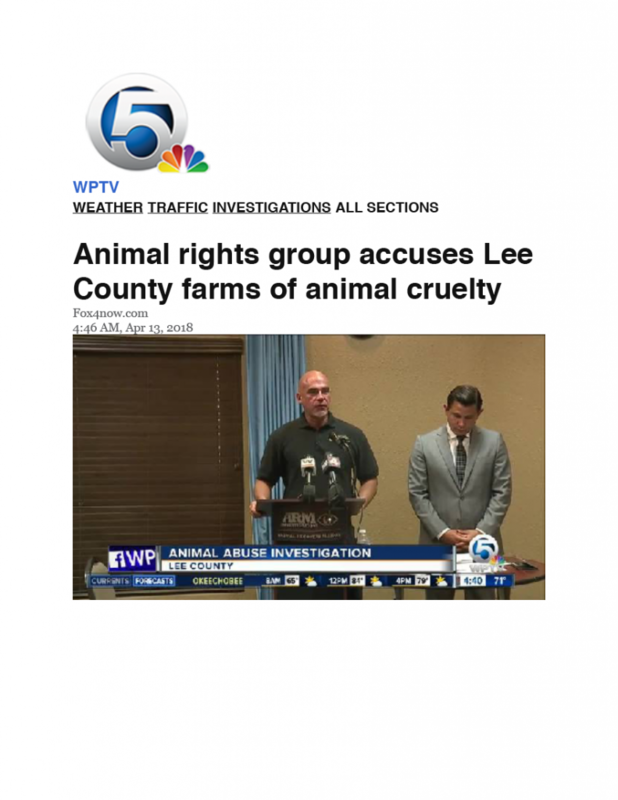 At the conclusion of these investigations, ARM compiled detailed reports containing its investigative findings and presented them to local and state enforcement agencies, including the Lee County State Attorneys Office (20th Judicial circuit district). However, ARM’s evidence has been met with repeated resistance and reluctance of enforcing arrests and shutdowns of these illegal establishments. 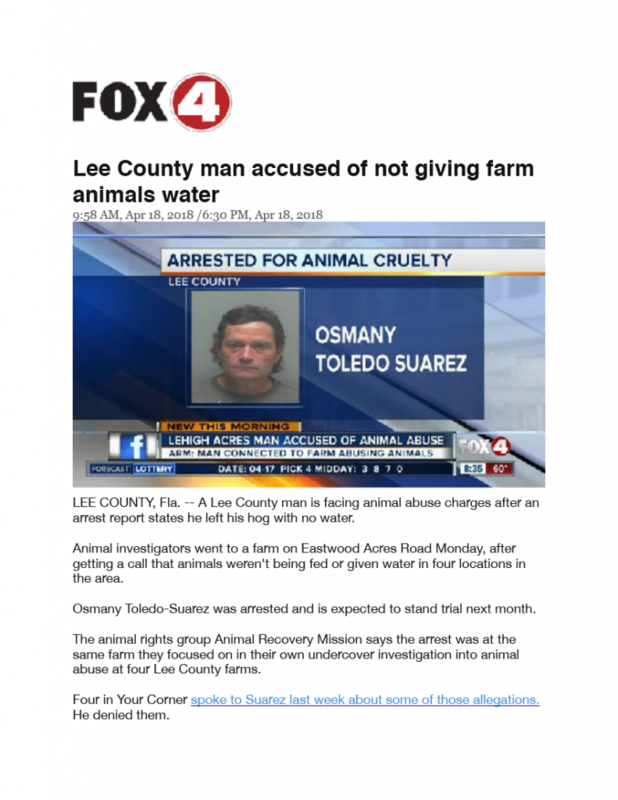 Since initially taking the completed cases to the Lee County Sheriff’s Department and SAO office, the animal cruelty and butchering of animals have increased, and has in fact become more inhumane. 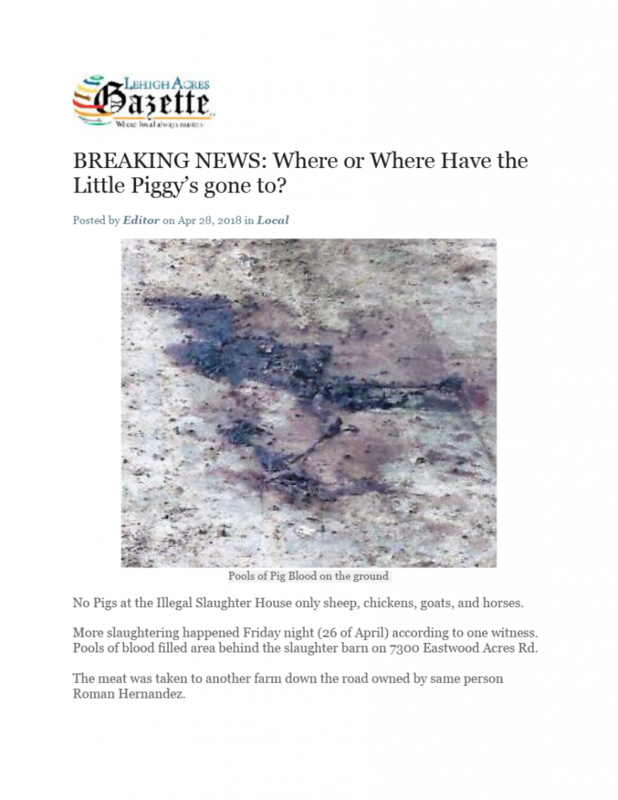 In addition, due to a lack of regulations and enforcement, new slaughter farms have opened in the surrounding area and are, at this time, operating freely. Once prevalent in Miami-Dade county, career criminals are now starting to migrate north to Lee County, viewing the area as a safe haven with little to no enforcement from official governing agencies. 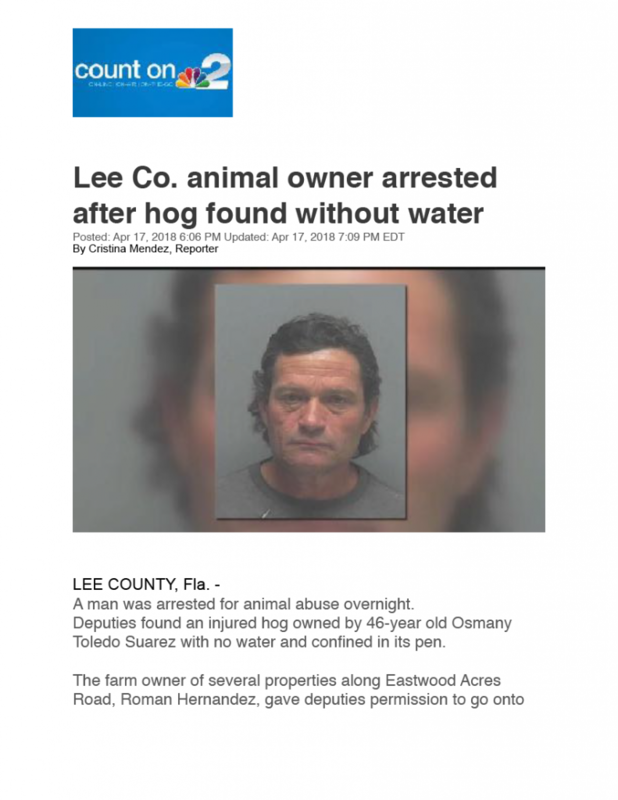 In April of 2018, after making multiple attempts, and witness statements to the crimes committed, to present evidence of animal cruelty to the Lee County Sheriff’s Office Sgt. 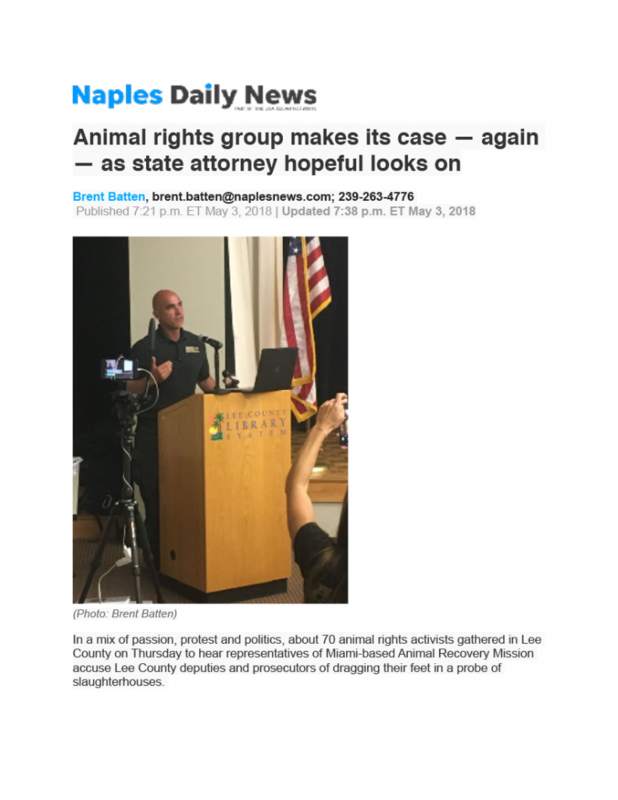 Randy Hodges, Assistant State Attorney Cameron Siggs, and Assistant State Attorney Larry Justham, in the hopes justice would be brought by the convictions of barbaric animal abusers, ARM’s exhaustive investigations were for naught. ARM was warned that if their investigations continued, it’s operatives and Founder, Richard ‘Kudo’ Couto, would be arrested and charged with the same crimes that career criminals were conducting. 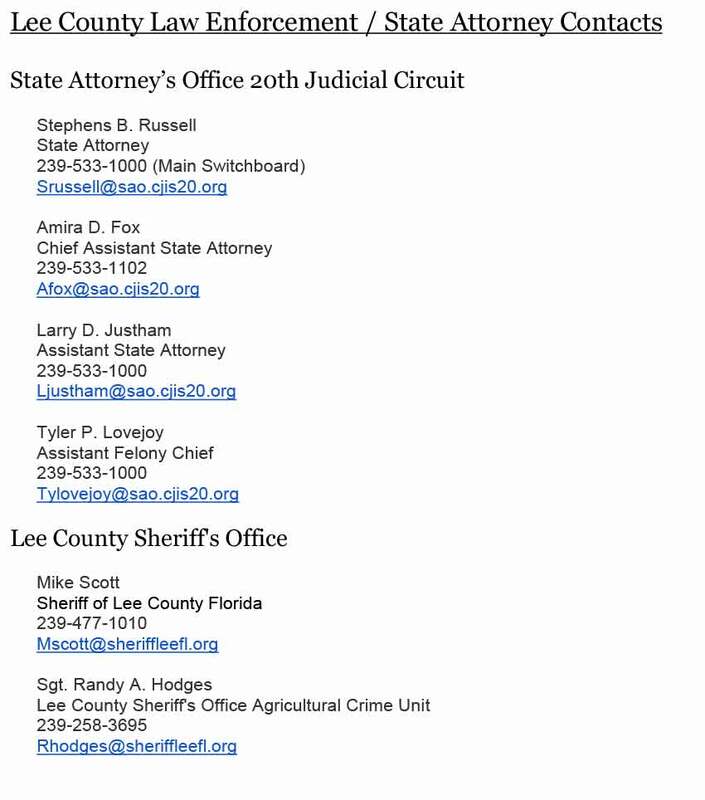 View email correspondences between ARM and Lee County SAO / Sheriff’s office here. 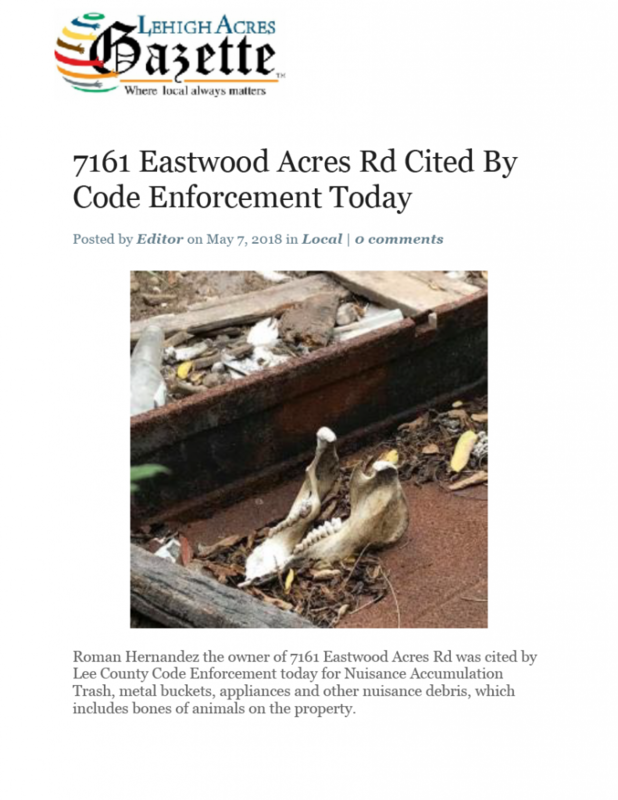 The Lee County SAO also highlighted that ARM’s footage was obtained illegally, being the reasoning why official agencies were unable to prosecute with the evidence provided. This amidst audio law cases which ARM already succeeded in court with in West Palm Beach cases previously. 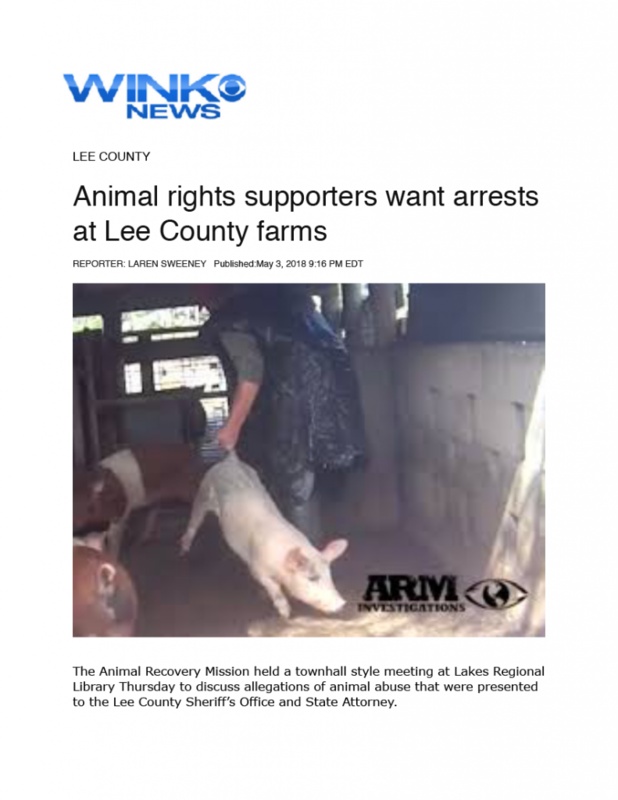 To date, the Lee County Sheriff’s Department, and the State Attorneys Office have been in possession of ARM’s viable and admissible evidence of criminal animal abuse activities, for well over six months, and longer on some cases. 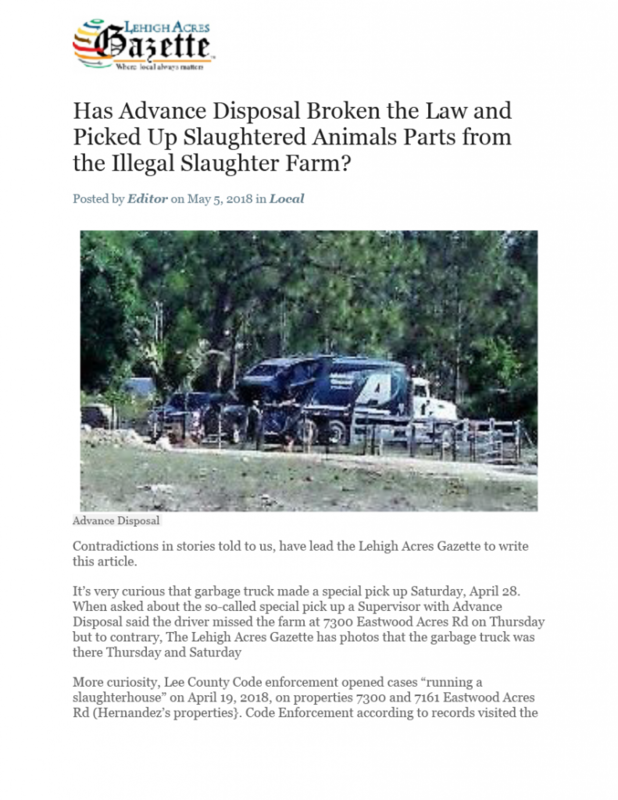 To ARM’s knowledge, the Sheriff’s department has not conducted its own investigation, nor gathered any evidence, and yet the Lee County State Attorney’s Office have since declined prosecution of these cases. 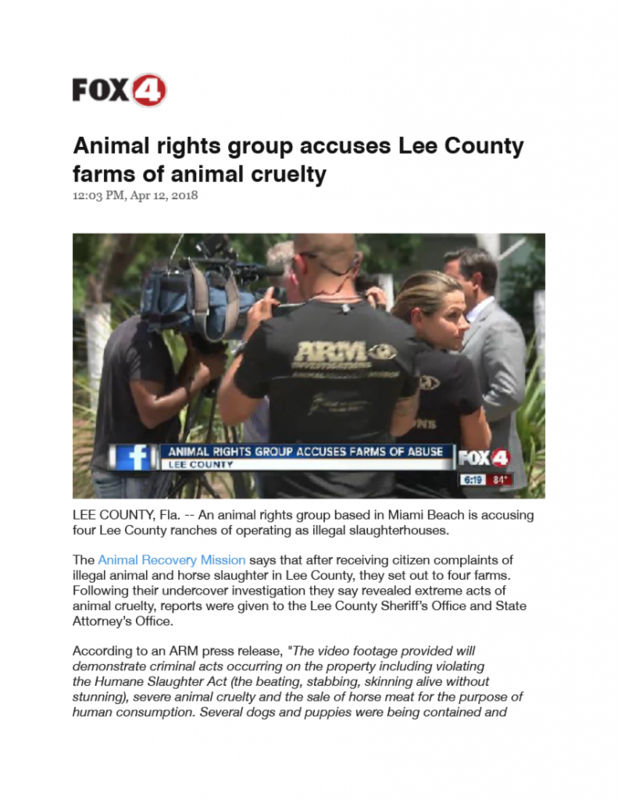 On April 12th, 2018, ARM was compelled to disclose its findings by hosting a press conference in Lee County Florida to release its footage and knowledge of these cases. 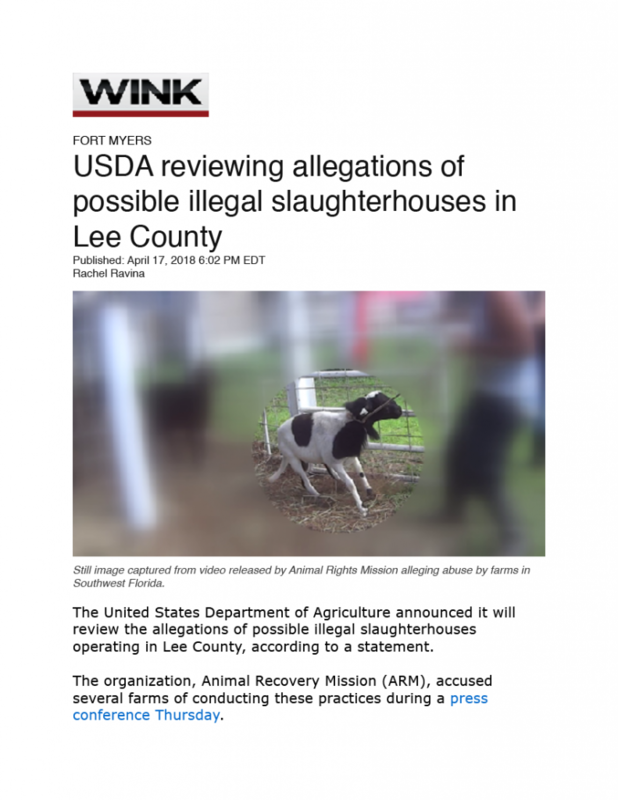 Due to the breakdown within the Lee County’s Sheriff Department, State Attorney’s Office, the USDA and the Florida Department of Agriculture, the Rancho Cabrera continues to operate with impunity, free from sanction or prosecution. Countless animals waiting to be rescued will continue to suffer heinous crimes until the public and media demand otherwise. 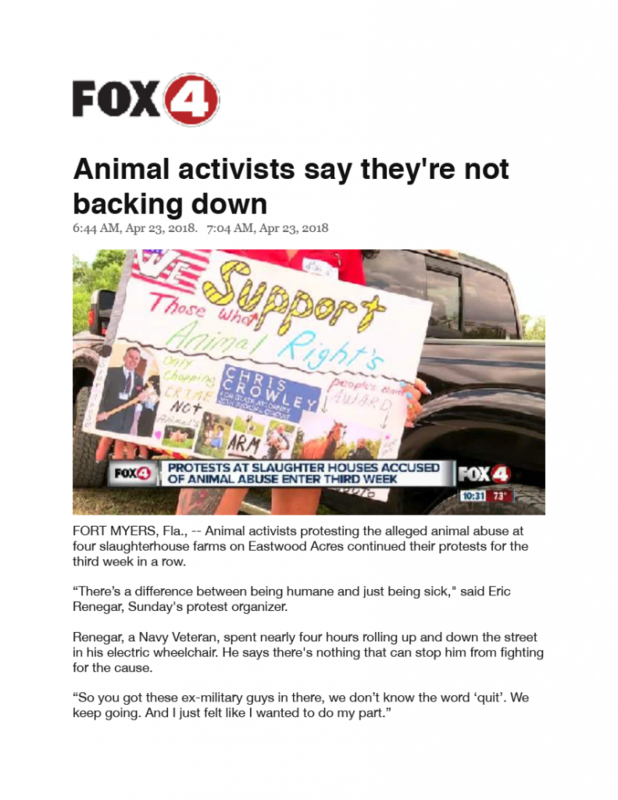 Updates following ARM’s plea to help hundreds to thousands of tortured animals, and ensure the arrests of criminal offenders, will appear on this page as they unfold. 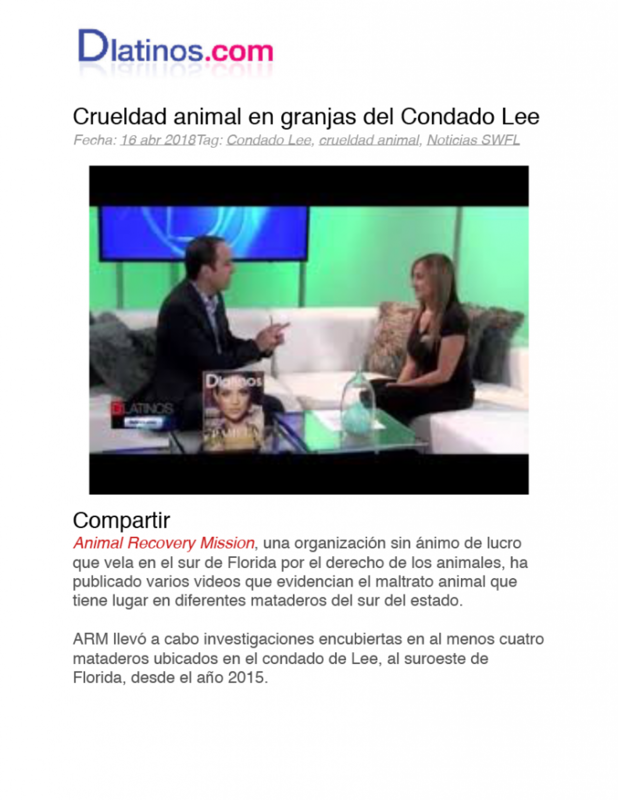 The Animal Recovery Mission is a 501 c(3) non-profit organization and all donations are tax deductible. Your generous donations aid us in our operations and emergency animal recovery missions.